At the north end of the Galapagos’ largest island, Isabela, a volcano straddles Earth’s equator. It is the Wolf Volcano, or Volcan Wolf, and it ranks among the archipelago’s most active volcanoes. Volcan Wolf’s first historical eruption was recorded in 1797, and nine more documented eruptions followed over the next two centuries. 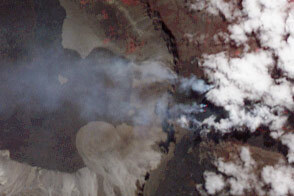 NASA’s Landsat 7 satellite captured this true-color image of Volcan Wolf on October 16, 2001. A combination of fresh green vegetation and old lava flows encircle the elongated caldera. The lava flows predominate on the volcano’s southeastern flank—dark rivulets of rock reaching all the way to the sea. Isolated lava flows also appear west of the summit. 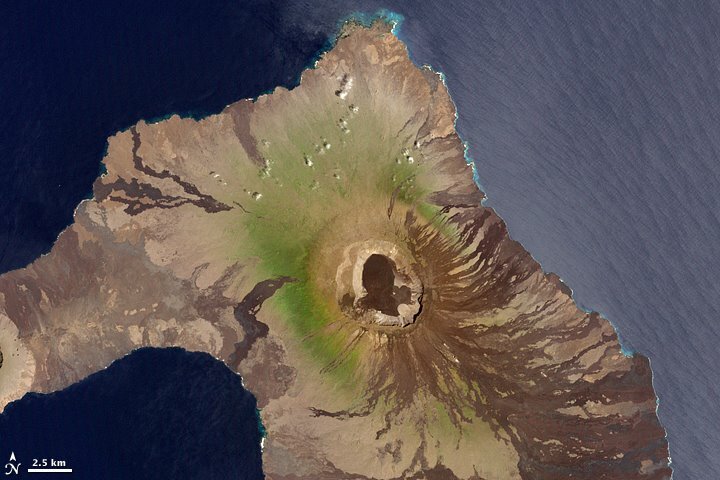 On the western and northern flanks, in between old lava flows, vegetation appears bright green. 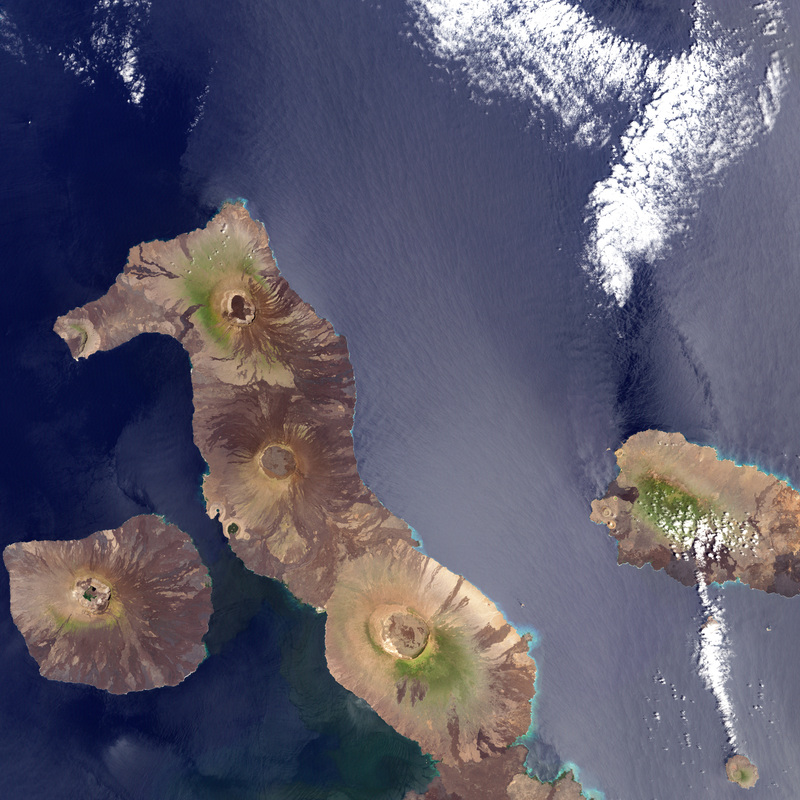 An especially bright band of vegetation appears west of the caldera. Although ancient by human standards, today’s Galapagos Islands, Volcan Wolf included, are geologically young and dynamic. 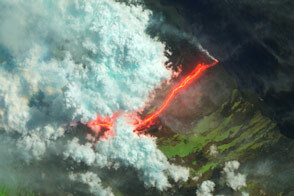 They likely result from a mantle plume, a column of searing-hot rock that rises from the Earth’s interior and builds volcanoes at the surface. Some parts of the island chain are less than a million years old. Likewise, some older volcanoes may have surfaced for a brief geologic time span before sinking below the ocean waves. Such surfacing followed by sinking might explain a new discovery at Volcan Wolf: pink lizards. First observed in 1986, a group of pink-tinged iguanas, named “rosada” were described in detail by an international team of researchers in January 2009. The researchers believe that this group of iguanas are a previously unknown species and that they provide evidence of ancient diversification among Galapagos land iguanas. The rosada iguanas do present a puzzle. The research team describing the iguanas estimated their age at 5.7 million years, yet geologists estimate the age of Volcan Wolf at less than half a million years. One possible explanation for this discrepancy is that the iguanas evolved on an older volcano that eventually sank below the waves, and their descendants moved to new quarters. The nineteenth-century naturalist Charles Darwin visited the Galapagos Islands on the Beagle expedition of the 1830s. He later developed the theory of evolution by natural selection based partly on his observations of the archipelago’s animal life—though not the pink iguanas. Darwin’s visit didn't include a stop on Wolf Volcano. Volcan Wolf’s first historical eruption was recorded in 1797, and nine more documented eruptions followed over the next two centuries. American Museum of Natural History. Darwin. Accessed January 16, 2009. Black, R., (2009, January 5). Pink iguana rewrites family tree. BBC. Accessed January 15, 2009. Gentile, G., Fabiani, A., Marquez, C., Snell, H.L., Snell, H.M., Tapia, W., Sbordoni, V. (2009). An overlooked pink species of land iguana in the Galapagos. PNAS, 106(2), 507-511. doi: 10.1073/pnas.0806339106. Smithsonian Institution Global Volcanism Program. Wolf. Accessed January 15, 2009. White, W.M. (2001, January 23). Galapagos Geology on the Web. Department of Earth & Atmospheric Sciences, Cornell University. Accessed January 16, 2009.